I have been thinking about building an LC meter for a while since I do not have a multimeter that is capable of measuring inductance and while the multimeters I have can measure capacitance, they are not able to give accurate readings for small capacitance in the range of several pF’s. 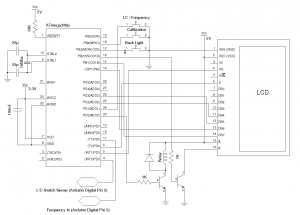 There are quite a few good articles on how to build LC meters using PIC MCUs (like the ones here: 1, 2, 3), but instructions on how to build one with an ATmega MCU are few and far in between, although the basic principle is largely the same. So I decided to write this article on how to build an LC meter using an ATmega328p chip and Arduino libraries. A typical LC meter is nothing but a wide range LC oscillator. When measuring an inductor or capacitor, the added inductance or capacitance changes the oscillator’s output frequency. And by calculating this frequency change, we can deduce the inductance or capacitance depending on the measurement. 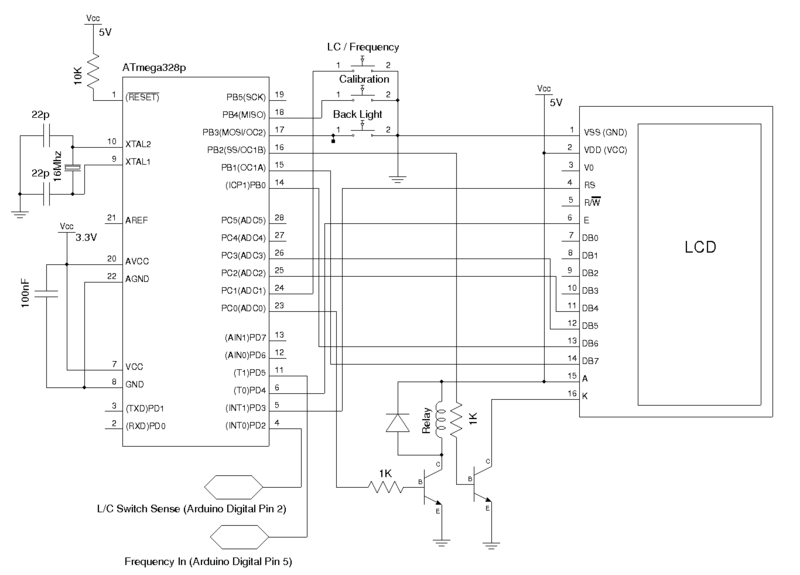 The following schematic shows the comparator based LC oscillator I used in the LC meter. The oscillator portion is quite standard. Most of the other designs I have seen use LM311 comparator. But for this type of application, any comparator capable of oscillating up to 50kHz should be more than sufficient. I happen to have some spare LM339’s lying around so I used it in the oscillator circuit. Note, there should be a 3K pull up resistor on pin 1 and the feedback resistor should be 100K instead of 10K. Choosing a high accuracy L0 and C0 helps improve the accuracy of the meter. This circuit is capable of measuring inductance in a wide range, from a few nH all the way up to a few Henrys. For capatance measurement, I have found that it is most suitable for measurement from a few pF to tens of nF. You maybe able to measure slightly larger capacitors if they have a high ESR rating. But this range limit in capacitance measurement should not be an issue as what we care most about is the accuracy in the pF range. I used this frequency library for the frequency measurement. By default, the display is updated every second. This mode provides the most accurate result. You can shorten this update interval easily, but the measurement accuracy will be reduced. 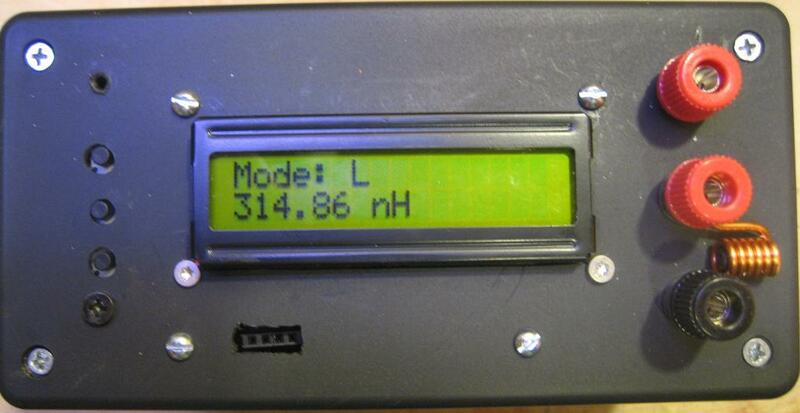 The Arduino code for this project can be downloaded here (LCFrequencyMeter.zip). This project was developed using the NetBeans IDE and you may need to adjust the included header files if you are using Arduino IDE. For more information, please see my previous article on this topic. The calibration method I used is like this: in capacitance measurement mode, the none-load reading is used to calculate stray inductance (assume that C0 is accurate) which is then used to compensate capacitance measurements. And similarly, in inductance measurement mode, we assume that L0 is accurate and the none-load reading (by shorting the test leads) is used to calculate stray capacitance which is then used to compensate inductance measurements. If you read through the code you will get a better idea on how this is done. 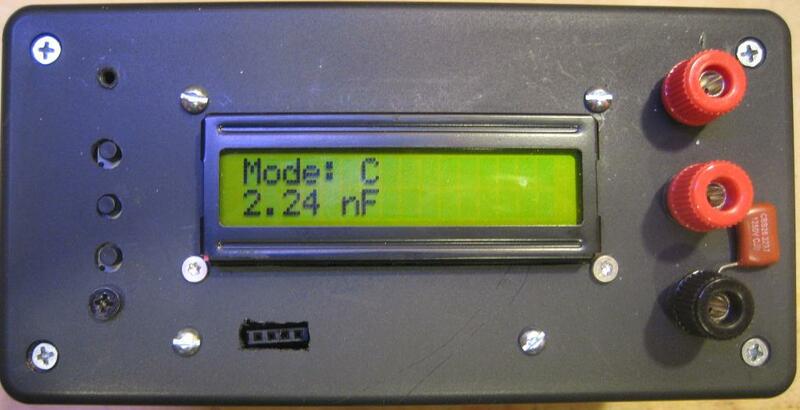 Within a selected mode, the display is auto ranged for the components/frequencies under measurement. Hi Kwong, what’s the range of Lc meter (anductance), how about the accuracy? I have used it to measure capacitance from several pF up to a few uF and inductance from several nH to 100 mH. Because the circuit essentially acts like a frequency counter, its accuracy is largely dependent on your reference L/C value. So if your reference LC are accurate, this meter can be extremely accurate as well. Hello! Thanks for the quick responds to previous question I asked. Pls, I want to understand something. Digital pin 5 (Frequency in) is not declared and used in the program. Can U explain that to me? OR How is it used? Its ok kwong. I have found it declared within the frequency library. nice job i fix the cirquit but not working screen is not open what is wrong please help me to fix it ! thank u! Is that resistor on the first op amp circuit a 10k or a 1k or what? it’s marked 1\k. C’mon, what is the answer :] ? Is it that “feedback” resistor (then it’s 100K)? I’ve also already figured out that the “feedback” one that must be 100K instead of 10K is the last one in the right side of schematics. I’ve made a very simillar LC meter. The problem is, that it is very unstable. What I mean is that, when in calibration mode it goes from 432,5 kHz to 437,1 kHz in about 20 minutes! Good question, as the stability of an opamp LC oscillator should be well within 1% over time (that’s already 10000 ppm). I’d change the reference L/C components and see whether that changed the outcome. Now I really DO need help :] I’ve put everything in place, double checked and fired up – but the only thing I can get out of it is “Mode: C / Mode: L” and “—” in second line. I have no idea how to start debugging it, finding the cause and making it work. I would be really thankful for an advice. A) I’ve ditched all the frequency-measurement-related part (since I only need it for measuring an inductor) – so no relay, no LC/Frequency button and pins 2 and 6 are directly connected on LM339. I don’t think I could have messed anything up here :]. B) I’ve used 1K for a resistor marked as “1\K” and 100K for this one: http://snag.gy/GwKvY.jpg . Those are the only modifications to the original circuit, everything else is as drawn (double checked). C) L/C switch works: it changes modes on LCD successfully. D) Calibrate button works – once it’s pressed, “Cal” appears on the LCD briefly. E) If I reset the Arduino Uno – I get a brief display of “27.20 nf” or “6.01 mH” briefly, then it goes to “—” and doesn’t change ever, no matter what mode and what I plug into test contacts. F) Code wise, I only added FreqCounter library to Arduino IDE, and removed folder names in includes (“FreqCounter/FreqCounter.h”->”FreqCounter.h” and “LiquidCrystal/LiquidCrystal.h”->”LiquidCrystal.h”. That removed all the compiling errors. BTW, where do all the other includes are comming from? Do I also have to get and install them, or they are something left from that NetBeans thing and doesn’t play a role in this code? Thanks in advance for your answers/guidance! C Mode: displays wildly alternating digits, mostly negative. 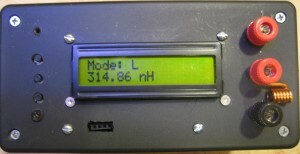 L mode: whatever I plug in – shows “ovf nH”. As I understand it’s far from the digits that should be seen. One more thing – I didn’t do anything with “there should be a 3K pull up resistor on pin 1” part. Might it be the reason? Can someone explain how this should look like? That might have been the issue, as LM339 has open collector output, you will need a pull up resistor at the output for it to work correctly. To isolate the issue, you could also by pass the second IC (e.g. connect the output from pin 2 of LM339 to Arduino pin 5) temporarily to see if it works. Can an LM1458 be used in place of the LM339? Duh, maybe I should look at the datasheets a little more closely. More digging to do. I can finally get a capacitance reading with a capacitor connected. When I hook up and inductor and press the LC sense switch, it give me a frequency. When I press it again, the inductance is briefly displayed before going back to Mode:C. I guess I have more troubleshooting. Is the default mode “L” or “C”? It’s set by the switch. I guess I’m trying to say, when I turn mine on, it is in Mode C. I press the LC switch and I hear the relay change position and it goes to Frequency, and displays a frequency. I never see Mode L. When I press it again, it will briefly display an inductance, before going back to Mode C. The Mode L never shows up on the display. There are two switches: the DPDT one is for switching between L and C (the one towards the left of the schematic). The SPDT switch is for switching between frequency or L/C measurements. Hello, I have built your LC meter -which will be very useful -but I have been unable to load the software. I’m using the Arduino IDE and the problem may be that the version I have is 1.0.5 and I can’t get version 0018 (which I believe you used) or it may just be that I don’t know what I’m doing. There seems to be a problem with the libraries not being available. I would be grateful for any help! and it will compile (given you have downloaded the frequency counter library I mentioned in my post). Good luck! can we use atmega328 instead of atmega328p? The code should be identical (328 has different chip ID as 328P, but if you can program it then either should work). Is it necessary to use atmega? can we jst connect the lcd pins as defined in the code?. I used a Reed relay, but pretty much any SPDT relay would do the trick. The current rating is not important as we are only using it to switch small signals. All I want here is to measure the capacitance with the ATmega328p (Arduino Pro). I have therefore removed the two switches. I made connections straight through from pin 2 to pin 6, I could properly completely neglect the Schmitt trigger/the second comparator, however didn’t in my first try. I then connected straight through from the input (GND) to GND and from input (High) into the junction where the 1000pF capacitor and the inductor are joined. I have corrected your feedback resistor from pin 1 to pin 7 to a 100kOhm resistor in stead of 10kOhm, as well as added a 3kOhm resistor from pin 7 to Vcc. Since I wanted another resonance frequency, than yours, I have changed the capacitor in the LC circuit to 470pF rather than 1000pF. Theory says ~488 kHz, as fare as I have found. Which should be below what the LM339 will run (>500kHz). The LM339 is powered at pin 3 with Vcc and pin 12 is connected to GND. I have connected the non-inverting inputs of comparator 3+4 to Vcc and the inverting of comparator 3+4 inputs to zero. No ATmega is connected, only 5V LAB power supply and an oscilloscope on output from both pin 1 and pin 2. No square output and what I get is very weak noise oscillations, properly from the overhead lights. I can send hand drawings of my design, output from the oscilloscope, and pictures of the circuit. The prototype is done on a PCB stripboard. I’ll try redo the board tomorrow on a new piece of PCB Stripboard with another layout I have drawn up today. To see if I have been handling something wrong on the first drawing or made bad soldering joints somewhere. If the inductor is correct then the system must have 3160pF capacitance installed??? The stray capacitance from the board is a few pF’s maximum. Did you check the waveform? I suspect that the counter was not counting correctly and it may due to the input waveform. II BECOMES PLAIN WHITE, I HAVE winRAR software but it doesn’t open. WHAT SHALL I DO GUYS. Not sure why, could you try 7-zip? AGAIN, CAN I GET A SHORTLIST OF CIRCUIT COMPONENTS USED? COZ IN TANZANIA WE HAVE HAVE NO ELECTRONIC SURPLIERS, WE HAVE TO IMPORT..
1. WHAT IS THE FUNCTION OF RELAY CIRCUIT IN THE MIDDLE WAY BTN MICROCONTOLLER AND LCD? SOME ACCURACY REASONS? MUST IT BE 16 MHZ? 3. WHAT IS THE PURPOSE OF 100 NF CAPACITOR CONNECTED ON 3.3V ON THE LEFT OF MCU? 4. WHAT IS THE TECHNICAL NAME OF SWITCH USED ON THE CALIBRATION AND BACKLIGHT PORTIONS THERE? Why is Pin 20 showing it connected to 3.3V when the Arduino has that connected to 5V VCC? Can it be used with just 5V, or does it need a 3.3V supply as well as 5V? The switching arrangement is not clear on the diagrams, the relay appears to be the SPDT contacts that switch from F to LC, though it’s not marked as such. What about the L/C switching, it that just a DPDT switch (I can’t see one in your pictures) or am I missing something? 2. The oscillator is for the micro’s clock circuit and it’s very likely it’s necessary or they wouldn’t have added it. 3. The 100nF cap is used as a bypass capacitor, without it the current switching peaks would likely cause noise and momentary supply drops that would upset the operation of the micro. It’s value is not critical, but 100nF is a commonly used value. Ideally use a low inductance Monolythic ceramic cap, also known as a Monoblock. If you are using an Arduino board, this cap would already be fitted (and likely a few more around the board too). 4. The switches are just common pushbuttons, typically small tactile pushbuttons are used and they are readily available from electronics suppliers worldwide or ebay. I think you’ll have to sort your own list, but nothing in this circuit is fancy, it’s all just normal commonly used components. Yes, should be just 5V. The circuit works with either 3.3V or 5V. You should be able to see the DPDT switch in http://www.kerrywong.com/blog/wp-content/uploads/2010/10/LCMeter_Core.png. Thanks Kerry for the clarification with the voltages. I could see the DPDT switch, but was just a bit unsure, as the switch and the relay looked identical (other than being DPDT Vs. SPDT), but it’s clearer now thanks. Thanks a lot for this awesome project…. #include as u have mentioned above. And the code have been successfully uploaded to the arduinoUNO with no compilation errors.And all the switches(with relay), LCD, modes are working correctly. But my problem is it seems like the oscillator is not working. Even after the calibration it shows changing minus(-) values in both L and C modes. And they speedily change in a huge range. In the frequency mode it shows a frequency value of 50 Hz all the time. Still I can’t figure it out how does that 50Hz default value come from. I know this question is quite familiar to you because i have been through most of the comments above:). PS: I have used LM339N instead of LM339P… Is this the reason? Other components are exactly same as you have metioned. In my previous comment newly added libraries have not appeared correctly. It’s hard to tell… the oscillator portion is pretty simple, and if you hooked it up correctly it should oscillate with a wide range of LC values. The 50 Hz you is most definitely from the mains. To isolate the problem, I would suggest testing the output from pin 2 of the OpAmp (see the first schematic). If you have an oscilloscope that would be ideal as you could observe the output waveform. But even without an oscilloscope, you should be able to tell whether the circuit is oscillating properly or not via a decoupling capacitor and a multimeter in AC voltage mode. Great! The accuracy of the circuit largely depends on the accuracy of your reference R/L. YOU SAID YOU CHANGED THE IC. AM SURE YOU MEANT THE COMPARATOR. NOW WHICH COMPARATOR DID YOU USE INSTEAD OF LM339? I WANT THAT IC SPECIFICATION SO THAT I CAN TROUBLESHOOT MY PROBLEM AS WELL. stupid question: what is the relay doing? How is it triggered? I tried to understand the circuit and the explanation of Sleepwalker3, but failed. Could you explain and maybe give details on specs? When you press the LC/Freq button it’s toggling the dispfreq variable which then determines if the relay output should go high or low. That turns the transistor on or off and so turns the relay on or off. From what I understand, the relay’s contacts are the ‘switch’ between the two comparators, which selects Frequency or L/C measurement. So by pushing the LC/Freq button, you are effectively switching between Frequency and L/C. 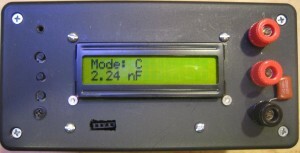 That variable within the code also determines if the LCD will display the Freq. From there the actual freq seems to determine whether it’s displaying Hz or kHz (the code says KHz, but it should read kHz with a lower case k). The relay type shouldn’t matter too much, but you’d be best with a small signal relay (or Reed Relay), preferably with gold contacts (not essential), as they will be more reliable for small signals, but most small relays will do, providing they are Change-Over (C/O) contacts (also known as SPDT) and providing the coil is a suitable voltage, e.g. 5V. The transistor could be anything with a suitable current rating for the relay. Some that would likely be suitable in most cases would be BC639, 2N2222, etc. The code for the backlight seems to work in a similar fashion, just toggling to the opposite state when the backlight button is pressed. I hope that explanation helps. Now maybe somebody can help me? Has anybody got the code in Hex file or Bin file form? I don’t use Arduino, but I have access to professional device programmers, so it’s much easier for me to quickly load it with a Hex or Bin file than wasting time setting up a bloated Arduino IDE that I’ll hardly use, loading up the Bootloader first, etc. etc. In the LC Meter Oscillator, the inductor is a 221uH but I only have a 220uH is this alright or should I add a 1uH inductor in series to bring it to a 221uH inductor? Whats the max frequency it can measure ?? 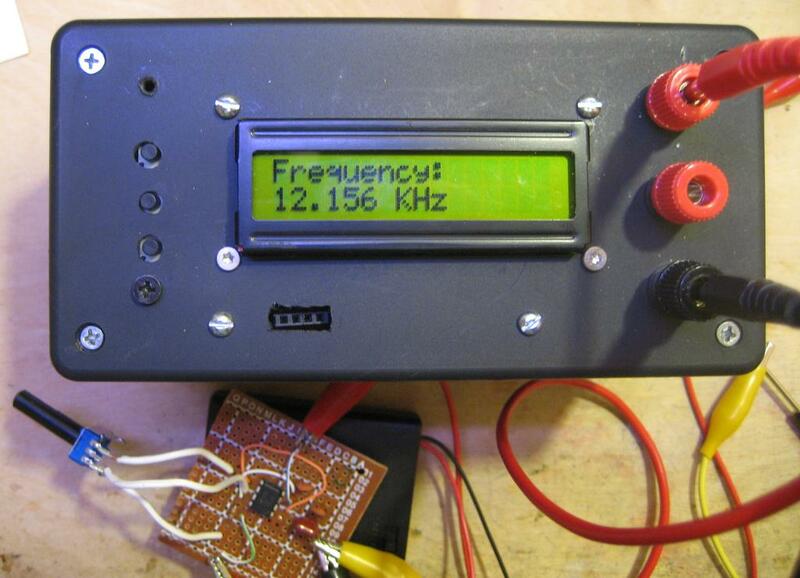 The highest frequency it can measure is 8 MHz. Hello. I would like to ask you something about frequency measurement. I need to measure frequency in my power circuit which generates ac square waves. The voltage of this circuit is 30V. I can measure it by my multimeter, but is it possible to measure it with your meter. Than you for your answer. You can always use an attenuator (e.g. voltage divider in this case) to keep the input voltage under 5V and the voltage is level shifted to be above ground (i.e. add a DC offset to your input signal) then you can use this circuit to measure frequencies up to 8 MHz. can i get the source code of this project?? in Kiswahili: SOURCE COSE IPO KWENYE LINK JAMAA KAIWEKA NDAN YA MAELEZO YAKE HAPO JUU..
in Engilsh: SOURCE CODE IS IN ONE OF THE LINKS POSTED BY THE GUY ABOVE IN HIS DESCRIPTIONS. if I want to build a meter using to measure capacitance only, how can I simplify the circuit? At the beginning, I should connect the measured capacitor to be ground in both sides. Or do I get wrong? Because I see there is a gnd before the inductor. So the pin (L) and GND are both grounded. I cannot have frequency output. Also, two sides of inductor (221mH) is 0V. The measured capacitor is 0V in two sides. I’m working with measuring LC circuits for coils in the range of 10 to 200uH @ 40khz. Its my understand that the frequency is pretty important to determine the best impedance matching for my circuit. How does this relate to this circuit is there a way of selecting frequencies? What about using a higher voltage to simulate what is coming out of the Class D PWM I am using also? The frequency of this simple circuit is determined by the reference L/C and the DUT. If your goal is to measure ESR and other characteristics that depend on frequency you will have to take a different approach. Thank you for posting this circuit. I have a question about the calibration source code. I see you set the frequency FO to the frequency read during calibration, but you also change the L0 and C0. It seems that if you calibrate twice then the L0 and C0 will end up being the same as Lth and Cth. The first calibration may change then because F0 changes, but a second calibration seems like it would set them back to Lth and Cth (Assuming the read frequency during calibration stays the same) because the calcV function will return zero if the frequency is the dame as F0. Am I missing something here? Can you plese explain the thought process behind changing L0 and C0? Thanks. Thanks for your comment. So the assumption here is that the frequency counted by the MCU is accurate. This is a reasonable assumption since it is using a crystal oscillator. The calibration is done in either “L” mode or “C” mode. In “L” mode, we assume that the capacitor value is accurate and by shorting out the leads, the deviation from the theoretical inductance (e.g. the lead inductance or inaccuracy in our reference inductor) would cause the frequency to deviate from the calculated frequency. So to zero this out, we would add the stray inductance to the original value (so the display would show zero). In “C” mode, the assumption is that L is accurate so similar calculation is done to compensate the stray capacitance. Since calcV used F0, which is initially set to a constant (that later gets over ridden) and does not use Cth. Assuming that initial F0 constant is the theoretical value, then the first calibration will adjust the offset accordingly, but the second calibration will likely undo this. I think you should reset F0 to the theoretical frequency before doing this, or you calculate L0 from frq and Cth instead of using calcV. Perhaps I’m missing something. I have been developing software for over 30 years, but I am new to electronics. Does what I say make sense? How will i calculate the range of an LC meter. The range is largely determined by the maximum achievable oscillation frequency range, which in this case is at around 500 to 800 kHz. So given your reference L/C value, you can derive the value you can measure with this meter. Thank you Mr. Kwong for your LC meter circuit. I built the meter including the input circuit using an LM311 comparator. There is no oscillation on the output of the comparator and I’m having difficulty understanding the feedback components around the output and the inverting input of the comparator. Also, does the LC tank circuit get its energy from the 10uF coupling capacitor? If not, how does the circuit get energy to resonate? The 47K and 10u forms a RC circuit and depending on the output of the comparator it either charges up or down. The actual values of these components are actually not that important. Once the circuit starts oscillating, the voltage presented on the negative input to the op-amp is a triangular wave, with the amplitude depending on the RC value and the LC oscillation frequency. If you build an SPICE model, you can see this action clearly. Hope it helps! I have built this circuit and see the tank oscillator start up but then fade away as the RC circuit just climbs to 5volts and stops the comparator working. I am using 27k and 4.7uF ceramic in the RC circuit which I believe should be ok. IC is an LM 393. Any ideas where I might be going wrong please? Did you try other R/C values? Depending on the comparator, it is a bit picky on the actual RC values used. If you are using 393 could you try using the same values as what I had in the circuit? Thanks for this! Can I ask what kind of inductor the 221uH is and what the tolerance is? Typically you want to use an inductor with higher Q factor and with a tolerance as tight as possible. The accuracy of the meter depends largely on the tolerance of the reference L and C.
Thanks. I have less experience with selecting inductors than other parts (and then it has mostly been hand-wound toroids). Looking through Mouser, I can find some axial, molded inductors of 220uH under 3% tolerance (though they don’t stock them). Is this the type of part you used? I just don’t know what is a common part here. Also, they have Qs from 30-90 – not sure what ‘higher’ is in this context. Am I on the right path, or is there a simpler, more readily available part I should be looking at? The one you mentioned should be fine. You can always start with whatever kind that is available to you and see if the result (e.g. accuracy, etc.) is acceptable to you. A Q of above 30 is good enough for this application. What are the DPDT and SPDT switches used for? I can’t see them in any pictures of the finished project. Also could you please post pictures with the the built circuit? Hello Mr. Kerry D. Wong, Great Projects, I am working on DC-DC converter so i have to deal with freq and instructors so i want to build the same project. but I am not able to run this code in Arduino IDE. I modified the code according to your suggestion but it still not running. showing error of freqcounter lib. I included the lib but still not compiling. Please suggest me modification of the code. What’s the error you were getting? You might want to try a lower version of the Arduino IDE to compile the code as this project was compiled using Arduino IDE 1.0 long time ago. Actually Sir I am getting “LCR:198: error: ‘FreqCounter’ has not been declared” error. I am using Arduino IDE 1.0.5r2 Version. Did you download and copy the FreqCounter library into your Arduino library folder? Now my problem solved, i downloaded FreqCounter library and pasted in library folder of arduino. Program uploaded to Atmega328p successfully. now i am going to build op-amp circuit. As I can’t afford costly LCR meters, This project will help me lot because for dc-dc smps i have to work with inductance and freq. Thanking you again for such a great project. hi sir. is that vcc on the oscillator circuit use 5v or 3.3v? the exchange L / C F I do it manually with the threads of the breadboard. I put a capacitor 1,12nF and an inductance of 221nH. (I say this because use of inductances of known value). What can it be? It’s been quite a while since I built this circuit. I am glad there’s still an interest in it! If I remember correctly, calcV basically calculate the device under test based on a theoretical L or C value. are matching what you are using. Thank you for the reply. It’s why I got it. I wanted to know the operation that makes the command “CALV (f, l0)”. Mr Kerry is another clarification. What is the symbol next to the number 1 of the “Back Light” button? Nothing should be there, it was just some wiring didn’t get deleted. Hi, could you send me the arduino code pealse . The reason I am asking is that the label on the schematic does not match what is mentioned in your code (or maybe I am not following it correctly). These pins should be compatible with UNO. Pin numbers above 13 are analog pins (e.g. 14 corresponds to A0, 15 corresponds to A1…). Someone clear my doubts about…. Can we use Logic circuit or transistor as selection switch , instead of machenical reed Relay ??????? 2. A. How to / Can we modify its program code to increase L parameters from 0.00uh to 0.000uh ‘ or from 1 nh ‘ ?????? B. Does it needs 311 hi speed comparator for 1nh mesurment / 1 Picofarad ?? 3. Does Lm393P Dual comparator ( I hv ) will work Properly instead of LM339 Quad ic ????? I want to make this project with the Arduino Pro Mini ATMEGA328P-AU. I connected a standard programming connector with an AVR programmer, eXtreme Burner – AVR software. and I need a hex file with fuses. If you want to set up a hex file, I would be very grateful to you. Hello! Thanks for this project. I need only inductance meter (my multimeter can measure capacitance and frequency), so I’d like to simplify it. Do I need to use two comparators or only one? And I have some question about controlling power. Can I connect the circuit on the first picture not directly to VCC, but to some of the microcontroller’s digital outputs? I’m going to use SLEEP_MODE_PWR_DOWN, but ATmega isn’t the only part in this circuit which should be prevented from discharging batteries when it’s not in use.